Who doesn’t love strawberries? I have to tell you, years ago I was obsessed with strawberries! I had dishes, towels, sheets—you name it! If it had a strawberry on it, I wanted it. It is just a happy fruit to see and especially to eat! I also loved picking strawberries at my grandmother’s house when I was a child. What a treat! When great recipes are developed with strawberries, I definitely want to make them. 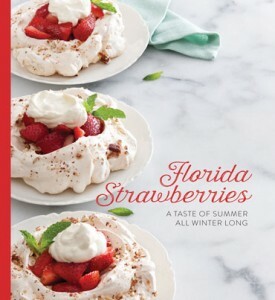 We published a fabulous book with one of our advertisers, Florida Strawberry Growers Association, and it is rich with yummy recipes using the fruit. 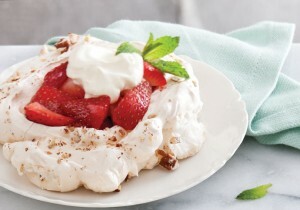 When I saw the meringue Pavlovas on the cover with strawberries and whipped cream, I was hooked! In fact, the recipe for those delicacies is presented here in hopes that you will enjoy them! Preheat oven to 275°. Line a baking sheet with parchment paper. In a medium bowl, beat egg whites, cream of tartar, and vanilla with a mixer at high speed until frothy. Gradually add ¾ cup sugar. Continue beating until mixture is glossy and stiff peaks form. Gently fold in pecans. Drop meringue by spoonfuls into 6 mounds on prepared pan. Use the back of a metal spoon to shape meringues, forming a well in the center and building up the sides. Bake until meringues are lightly browned, about 1 hour. Turn oven off, and let meringues stand in oven with door closed for 2 hours. Remove from pan, and place on serving plates. In a small bowl, combine strawberries and remaining ¼ cup sugar. Fill each meringue with about ¼ cup strawberries. Garnish with mint and whipped cream, if desired. Serve immediately. Meringues can be made ahead and frozen for up to 6 weeks. Who does not like strawberries?I grew up eating them out of the gardens of my grandparents, aunts and uncles as well as my parents. i was sick a lot as child with bronchitus, etc. My Mother always brought our frozen strawberries as well as cantaloupe balls from the freezer , for a treat and hopefully to make me feel better. As an adult, I have loved chocolate covered strawberries many times over, both made by myself and received as a gift. When I moved into my present home, over 20 years ago, I found the most wonderful ribbon with strawberries printed on it. So I bought all of the rolls of ribbon available and edged my kitchen windows with it.Then I had white valances above the windows. Everyone commented on my strawberries because they were a standout. Guess it is time to buy some strawberries, although in Missouri, it is a bit early to get good ones from anywhere. The thought of them makes my mouth water and brings back wonderful memories. My Mother always talked about having cold strawberry pop that had been sitting in the well, when she was a child! I used to travel to England often on business. We visited Ye Olde Six Bells, which claims to be the second oldest pub in England. The food was just okay, but the one thing I remember was their strawberry dessert which was very much like this recipe. It was heaven on a cloud! Thank you for sharing this dessert. I will definitely give it a try! This recipe sounds (minus the pecans) very much like the one given to me years ago by my (still) dearest friend. Living in Northern California, we were able to pick wild as well as commercial berries – strawberries, raspberries, … Our dry climate was perfect for making wonderful meringue! Due to our high humidity in Central Texas, I find one has to chose just the right day to attempt meringue (and divinity! ); but, that just makes the event all that more special!! 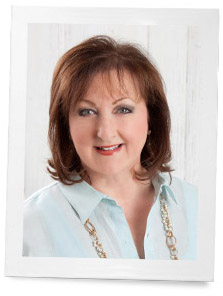 Tomorrow is supposed to be dry; think I’ll get out my Wedgwood and make some pretty nests (including the pecans) for some strawberries… What a pleasant way to spend a Lord’s Day afternoon!! My goodness! All this talk of strawberries! And the recipe, my mouth is definitely watering! During the Second World War, one summer I was visiting a cousin whose family was living temporarily in part of beautiful Bluff Hall, ante-bellum home on the bluff of the Tombigbee river in Demopolis. Her fiancé’s family owed Cedarcrest Farms in Faunsdale and when he was on leave he would bring fresh strawberries and super rich cream from their prize winning Jerseys to her. Perfect strawberry ice cream was made by simply adding sugar and freezing the cream and strawberries, or if we could be patient, making custard ice cream with big chunks of strawberries in it. It was the best strawberry dessert one could imagine, so cooling, rich and delicious. This is a little off the beaten path but want to share it anyway. I have always loved strawberries and would eat them right from my mother’s garden. When I was pregnant with my daughter I craved strawberries. My friend Connie said “I have the very thing for you. I will make my strawberry cake.” (from scratch) Oh my goodness, fresh strawberries in the layers and fresh strawberries in the icing. That was 39 years ago and I am blessed that she is still my dearest friend. We live way over here in California. Our town….Arroyo Grande… Closes down and celebrates the “Strawberry Festival” Memorial Day weekend every year!! We walk through town, enjoying the vender booths on the Main Street while enjoying strawberry shortcake and alllll good things strawberry!!! The little ones get strawberries painted on their faces and there are the races and music at the bandstand and our children, grandchildren and their friends all come home!! I don’t really know the names, but our strawberries are delish!!! Thanks for the recipe!!! Being a Canadian, I try to wait for our Ontario strawberries…nothing tastes quite as good as in season, local strawberries, which we try to pick ourselves at the many pick your own farms. I think the wait is definitely worth it, but in a pinch I guess I could get some form California…I have never seen any from Florida on our fruit stands. I love strawberries, and like you Phyllis, I had accumulated quite a few strawberry themed items. I even had the cutest strawberry print summer dress! Strawberries are my favorite and anything made with strawberries is delicious. Thanks for the heads-up about the book. I will go out and buy some fresh Florida strawberries and get cooking! I am going to make this recipe. Kindred spirits Michele I couldn’t hold out any longer, and bought the first (Florida of course) strawberries of the season last night as well. They are good, but not as good as North Carolina strawberries later in the year. We will dip them tonight in just a bit of chocolate for dessert. Wedgewood is celebrating their 50th anniversary of their beautiful pattern, Wild Strawberry? Would love a tea set in that pattern. Many years ago when visiting England, I bought the miniature Wedgwood Wild Strawberry set. At the time I collected everything “strawberry” but have since sold most of those pieces. But I still have my Wedgwood china pieces. I can’t wait for strawberry season here. The strawberry grower at the market has so many kinds. Each is so different. You think, this is the strawberriest strawberry I’ve ever tasted. Then you taste a different variety and it’s SO different, but again you think, no, THIS is the strawberriest strawberry ever! So many strawberries, so little time. We have to wait until May, at least. I won’t buy the ones from Spain–full of chemicals. Love the memories of picking strawberries at Mamaw’s house on Morher’s Day! Always think of those happy days & y’all on Morher’s Day! Mmmmm…just bought some from Florida last night at the grocery store.